Minister Khaw on shoeboxes: Second Warning this month? 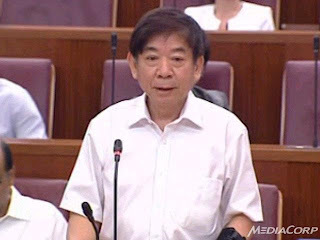 Minister for National Development Khaw Boon Wan on Monday said he would not hesitate to intervene should there be clear evidence of unsustainable investor demand for shoe-box apartments. He added that the Ministry of National Development (MND) was watching the situation closely. However, Mr Khaw cautioned that it would be hard for him to intervene at present as the market for shoe-box units in the heartlands was "untested", and he did not want to think he knew "better than developers or investors". Mr Khaw was responding to a question in Parliament by MP for Jurong GRC Ang Wei Neng, who asked if MND keeps track of the profiles of buyers of shoebox apartments. Mr Ang also asked MND to share how many buyers of shoebox apartments were HDB occupants, and if these buyers were staying in HDB flats larger than 50 square metres. In response, Mr Khaw said that MND did not yet have a good breakdown on the type of people that have invested in shoe-box units. "But eyeballing some of the data we have, it suggests they are mostly Singaporeans with HDB addresses," Mr Khaw added. "They obviously don't plan to stay there (in shoe-box units), because they won't be able to fit into 50 square meters with a family of several (people)." Mr Khaw said these buyers were likely to be investors who were parking their funds in shoe-box units, with the expectation of renting them out. "They must have seen shoebox units in the central region being able to be tenanted out easily with reasonable yield," he added. "The difference this time round is that most of the units are in the heartlands -- where the market is untested." He likened the situation to a ferry, which may be overloaded under certain conditions. "It's like a ferry designed for a certain capacity," Mr Khaw said. "If a ferry is overloaded with too many passengers, especially if they're sailing in shallow waters, it may sink. "But because it's an untested water and untested market, it is hard for me to intervene in the market, thinking I may know better than developers or investors." "I think the minimum I can do is to alert everybody that I can see long queues going to board the ferry, and I think my job is to share that information as much as I can with the investing public, as well as the developers," Mr Khaw added. Currently, there are about 2,500 units of completed shoe-box units, making up 1.2 per cent of the 210,000 non-landed units in private housing stock. The supply of shoe-box units is expected to increase to 9,700 units by 2015. Then again, IF most buyers of shoebox units are anything like the folks who have commented (about the subject) on our blog over the past week, there is absolutely nothing that Minister Khaw needs to worry about *fingers crossed*. No Comment to " Minister Khaw on shoeboxes: Second Warning this month? " TODAY's opinion piece: Your opinion? Property cooling measures: Round 6...?! Hard landing for shoebox investors...? Shoeboxes = HDB 1- and 2-Room Flats?